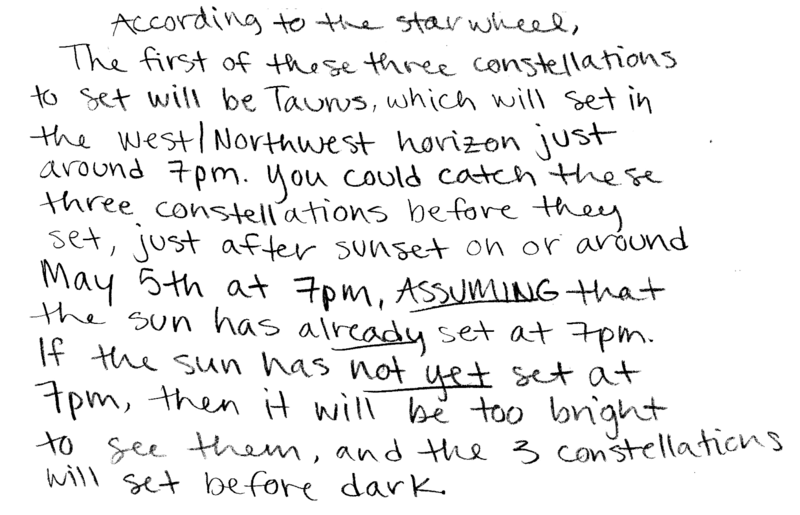 P-dog's blog: boring but important: Astronomy midterm question: still see three grand constellations low in the west? Astronomy midterm question: still see three grand constellations low in the west? During this month you'll see in the night sky three grand constellations: Canis Major, Orion and Taurus. But being low in the west they'll soon set, so catch them right after sunset while you can. [*] "Sky Maps: December 2017-December 2018," Skywatch (2018), p. 18.
reads off a plausible date corresponding to a time just after sunset (5 PM-8 PM?). Has argument on plausibility (or implausibility) that is consistent with these constraints. picked a time during the night that is not just after sunset (such as midnight). Still has argument on plausibility (or implausibility) that is consistent with these misinterpretations of the given constraints. Contains right ideas, but discussion is unclear/incomplete or contains major errors. Typically has both (3) and (4) above, but still has consistent argument on plausibility (or implausibility). Limited relevant discussion of supporting evidence of at least some merit, but in an inconsistent or unclear manner. At least attempts to use starwheel in a systematic manner. Implementation/application of ideas, but credit given for effort rather than merit. Discussion not clearly based on using a starwheel in a systematic manner.